The best month to snag a deal when buying a home? October. This isn't just some random guess; it's based on RealtyTrac's analysis of more than 32 million home sales over 15 years. The resulting data showed that on average, October buyers paid 2.6% below estimated market value at the time for their homes. Like a beach after Labor Day, the realty market clears out as the days turn crisp. Most summer buyers have already found a home, meaning a fall buyer will have way less competition for the available houses on the market, says Bill Golden of Re/Max Metro Atlanta Cityside. And don't worry about those buyers who didn't close before August, either. "Many folks will drop out of the market until after the new year," says Golden, giving a fall buyer even greater room to roam at open houses. There may not be as many properties to choose from, but as Golden says, "a little patience and perseverance could reap big rewards." Say hello to your little friend, leverage. 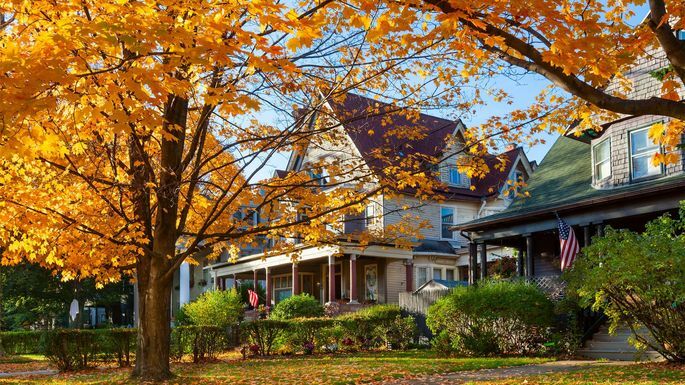 Sellers who have their homes on the market in the fall "are generally people who need to sell, which can make for better negotiations for the buyer," says Golden. And if a home you have your eye on has been on the market all summer, you're really in the driver's seat as far as making an offer the seller can't refuse. The longer a home sits on the market, the more negotiating power the buyer wields. Not only are most home sellers worn out after the summer selling season, they're also caught between a real estate rock and a hard place in that the holidays are barreling down on them. If they want to move and settle down in time to host Thanksgiving and put up their Christmas lights, they'll have to close, fast. So use this pre-holiday window to your advantage by offering to help them vacate fast if they cut you a deal. No one wants to buy a home purely to make their accountant happy. But there's a sweet added incentive to that makes the best time to buy a housee sometime near the end of the fiscal year. Come the following April 15, you might be able to take some nice tax deductions, including closing costs, property tax, and mortgage interest, to offset your taxable earnings. As the year comes to an end, fewer buyers also means you should have the full attention of your real estate agent, mortgage broker, real estate lawyer, and everyone else on your house hunting team. This is the best time to ask all those questions you have about earnest money, due diligence, title transfers, and more without feeling like you're horning in their busiest season to turn a buck. Once you close on that home you found in the fall, you may want to upgrade your appliances. Luckily, December is when major appliances—refrigerators, stoves, washers, and dryers—are at their very cheapest, according to Consumer Reports. It's also the best time of year to buy cookware and TVs. So once you're settled in (and provided you have any money left), get ready to renovate!